I confess that I've never been fond of slugs, but this is beautifully done. The textures are so subtle and the colors so rich that I'm glad you showed us how to look more carefully at something too many of us pass by. UGH! I'm not fond of slugs either, Jane, but you sure have found a dandy! Can't say I'm a big fan of these little creatures..but the image is absolutely terrific. Wonderful detail captured!!! 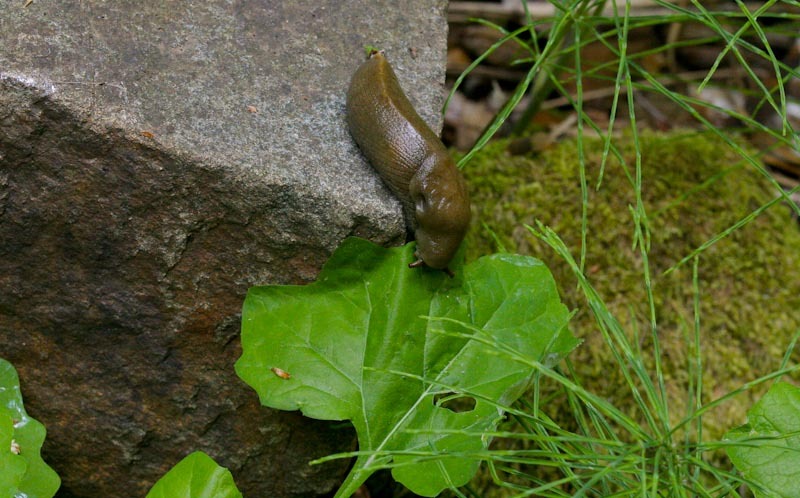 I particularly love the play of greens: the brown-green of the slug echoed in the moss and the rock contrasted with the bright greens of the leaves and grasses. nice to see him on my screen - it's as close as i want to get. well done photo. he's so shiny and squishy.. i wanna touch him! lol! great capture! I get a sense of movement, surprising in the photo of a slug. Here's an idea: Slug races in Wild Gulch!